EN:7:00 AM I have no plan… I’m still sleepy and I do not have a single good idea for this theme. DE: 08:46 – Ja… Ich hab‘s… Ich mache einen Space Shooter Verschnitt… Mit entweder Ludum Dare Games und oder doch Bonus / Gimmicks. Ziel – was Spielbares bekommen… Idee… man bekommt Upgrades an Waffen – die dann aber auch negativ das Spiel beeinflussen / wird langsamer oder nicht mehr so wendig. EN: 08:46 AM Yes… I’ve got it… I’m doing a space shooter clone… With either Ludum Dare games to shoot at and or bonus / gimmicks. My personal target – create something you can play… Idea… you get upgrades of weapons / get more weapons – but the amount of weapons also have a negative effect on the game / slows down or becomes less agile. DE: 08:57 – Ich habe mich zu einem Tetris Clone um entschieden… Wenn schon eine bekannte Spielidee klauen… Dann auch richtig 😉 Tetris hat auch den Vorteil, dass ich die Idee gut kenne, das Spielprinzip überschaubar ist (hoffentlich) und ich somit schnell an den Punkt komme, wo ich was abliefern kann… Eventuell kann ich die Blöcke dann durch Ludum Dare Themes ersetzen und dann kann es ja auch lustig werden. Ich mache mich an die Arbeit und bin konzentriert bei der Sache für die nächsten 3,5 Stunden. 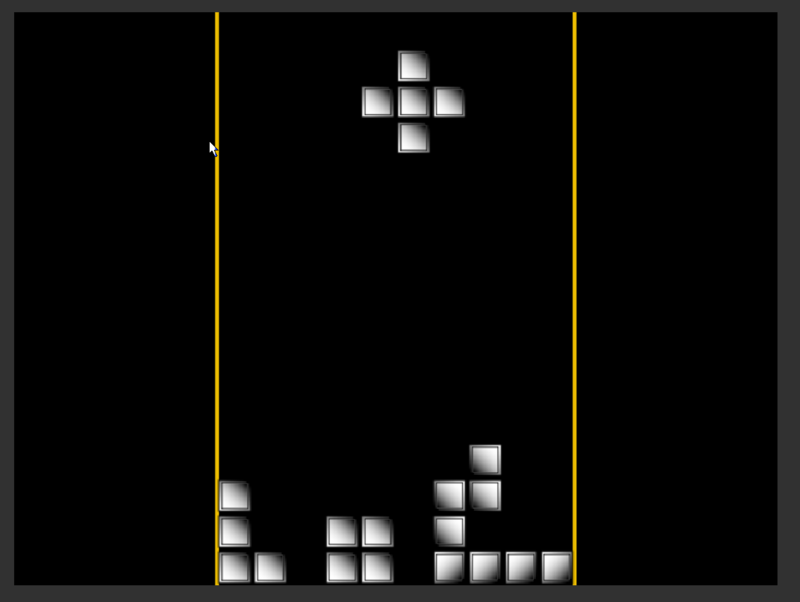 I have decided to go for a Tetris clone… If you steal a well-known game idea… Then also correctly; -) Tetris has the advantage that I know the idea well, the game principle is (hopefully) straightforward and I get to the point where I can deliver something… Maybe I can replace the blocks with Ludum Dare Themes and then it can be fun. I start coding and create an early prototype of a prototype 😉 At least I work very concentrated for 3 and a half hours.